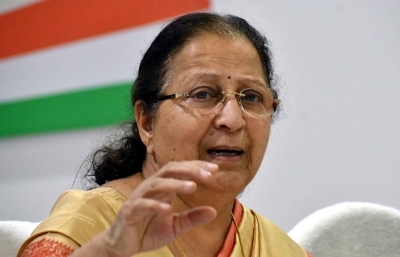 New Delhi, Feb 12 (IANS) A day before the term of 16th Lok Sabha comes to an end, Speaker Sumitra Mahajan hosted leaders of various political parties for a lunch. The lunch was hosted for ministers, leaders and chief whips of parties in Lok Sabha and Rajya Sabha. Besides Vice President M. Venkaiah Naidu, Deputy Speaker M. Thambidurai and union ministers like Rajnath Singh, Prakash Javadekar, Maneka Gandhi, Ramvilas Paswan and Harsimrat Kaur Badal, former Prime Minister H. D. Deve Gowda, Congress leader Mallikarjun Kharge, Nationalist Congress Party leader Supriya Sule, and Biju Janata Dal's Bhartruhari Mahtab were among those who attended the lunch. They were treated to a vegetarian menu that had 19 items. It was held a day before the conclusion of budget session of Parliament, which is the last session before the Lok Sabha elections expected to be held in April-May.